DURANDAL G1NL eSport equips with 2 types of Cherry MX mechanical switches and 2 types of color leds. (Cherry MX Red + Red color led and Cherry MX Black + White color led). Four levels of backlit LEDs that can be adjusted into any situation that gamers can enjoy in the late night combat! Cherry MX key switches, full USB N-key rollover capability, and friendly UI with programmable 5 profiles, up to 50 macro keys are powerful features. Its comfortable palm rest, headphone/microphone jacks, and two USB 2.0 ports are smart convenient extension for gamers. 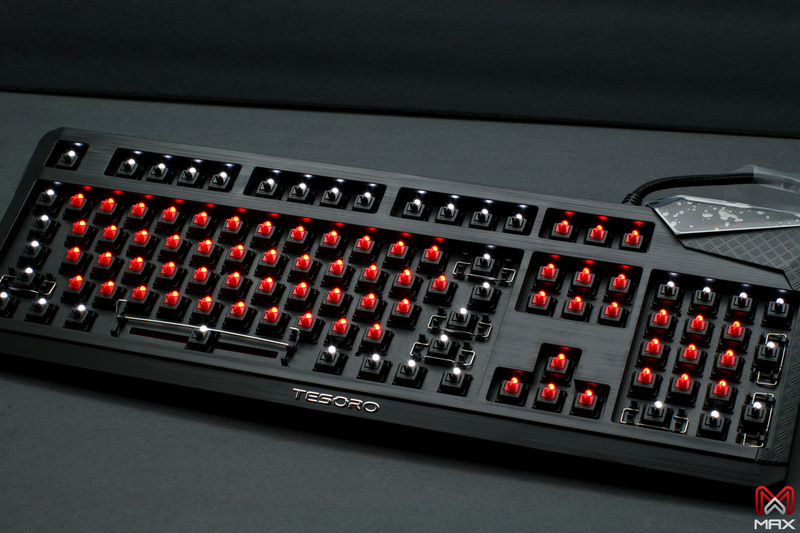 Cherry MX Red and Black mechanical switch is known for its typing feel with exceptional durability and reliability. It operates with an actuation point of 2mm and only requires a pressure of 45g-60g for the key to register a key stroke. Furthermore, the actuation point and release point of the switch are identical, which will facilitate speed, precision and more control in typing and less fatigue to your fingers. Added convenience right at your finger tips. Transfer files and photos from your thumb / flash drive at 480 Mbps high speed data transfer rate and 100mA power current on each port. Ideal for small USB mobile devices such as mouse, trackball, trackpad or joystick. While the 3.5mm integrated audio and microphone jack provide convenience for inserting a headset or microphone device, and clears up valuable desk space. Heavy duty braided cable provide additional flexibility and prevent tangle wired. 18K gold-electroplated connectors to minimize latency and provide reliable connection that optimizes signal quality and delivers the best transmission and data transfer. Attachable wrist rest pad provides maximum support to help relieve wrist discomfort and keeping your wrists in an ergonomic typing position. Rigid non-skid base keeps wrist rest firmly in place.